Under the counter where the coffee things sit in my kitchen, third drawer down on the left, is a waffle iron. We bought it on a whim years ago when Sean and his parents were talking about the waffle ice cream sandwiches at the CNE. Heidi is known for getting details right. It comes as no surprise then that this new book is an extraordinary object, smartly designed and impressive to hold. The raised cover, reminiscent of tin ceilings and anaglypta, is slightly velveted. Its pattern is elaborated upon in the endpapers, and the creamy off-white echoed in the matte pages between them. Every inch is considered. It is a book with clear, learned perspective. Divided into categories—recipes her inspired by her home, then those she likes for journeys, and finally recipes from the around the world—while reading Near and Far it is impossible to ignore a prevailing, longing wanderlust. Through Heidi's evocative photographs and passages, and her characteristic care in choosing just the right ingredients, you are transported to her kitchen and table, even when that kitchen is in Rabat, New Delhi, or Tokyo, rather than her native San Francisco. There is a distinct sense of real, rooted places, and an intimacy in the shared experience. Often it is a matter of alchemy in developing recipes; a combination of time, surroundings, outlook, and trend all contribute to a sort of collected whole. Heidi once said certain things "are simply in the air." In Near and Far, you're in that atmosphere with her. The breadth of this latest collection is all-embracing, and I've an eye on some to become new-to-me favourites—tempeh with shoyu butter, Lillet shrub, and farro salad (with this lip-smackingly piquant olive dressing) are all in the running. Then recently, Heidi told me her nephew Jack is a fan of the whole wheat waffles in the book. That was all the endorsement needed. These waffles, like so many of Heidi's recipes, are familiar, but somehow that little bit better than you recalled. Lacily, crackly-crusted as you expect, but the centre has a set-custard quality, vaguely eggy and slightly elastic, so there's chew to back up the initial crunch. In my mind, that's not just the mark of a good waffle, but a superlative one. Utterly fitting, considering where they came from. Tonight, with the leftovers, there'll be ice cream. Hooray, that. "These are the waffles I make most often—big, and Belgian-style. A combination of flours and rolled oats is lighted up with a bit of rice flour or organic cornstarch. It is a blend that conspires with lots of buttermilk to give the waffles a nice, moist interior and a crisp, golden crust." — from Near and Far: Recipes Inspired by Home and Travel by Heidi Swanson (Ten Speed Press, 2015). Preheat the oven to 225°F | 110°C. Combine the flours, oats, cornstarch, salt, baking powder, and baking soda in a large bowl. In a separate bowl, whisk together the buttermilk, melted butter, and egg yolks. In a third bowl, using an egg beater or an electric mixer, beat the egg whites into stiff peaks. Heat the waffle maker, and when it is ready, add the buttermilk mixture to the dry ingredients and stir until the mixture just starts to come together. Dollop the egg whites across the top of the batter and fold until uniform, using a few strokes as possible. Use a scoop to ladle the batter into your waffle iron and cook until deeply golden and crisp. Transfer to the warm oven while you make the remaining waffles—the dry heat of the oven helps them set a bit. Any leftover batter will keep for a day or so, refrigerated. I used the wheat germ suggestion rather than rolled oats. I served the waffles with Five Spice Roasted Peaches, mapled blueberries, and sweet labneh. I prepared the peaches as written, then stirred some wild blueberries through the leftover maple-vanilla syrup while the peaches roasted. I made the labneh from my cookbook, with orange zest, brown sugar, and vanilla (p. 229). The sprinkles are a bit of bee pollen. This recipe does make quite a lot of waffles; my waffle iron isn't super deep, so I think the yield was about 18. I froze the extras on a sheet pan, then transferred them to a freezer bag. They toasted up beautifully when needed. If preferred, the recipe halves neatly. It is difficult to come up with something original to say about Heidi Swanson, when she's such an original herself. It's even harder when everyone else is talking about her, and her fantastic new book, Super Natural Every Day, as they should be. Nonetheless I'll add my voice to the chorus of deserved cheers and say, "wow Heidi, well done." Like it was for countless others, Heidi's site, 101 Cookbooks, was one of the first food blogs I read. Her photographs were what caught my attention - the simple, honest styling, the softness of light - but it was her that kept me reading. And cooking. There's a laundry list of recipes from 101 Cookbooks that are part of my family's routine. 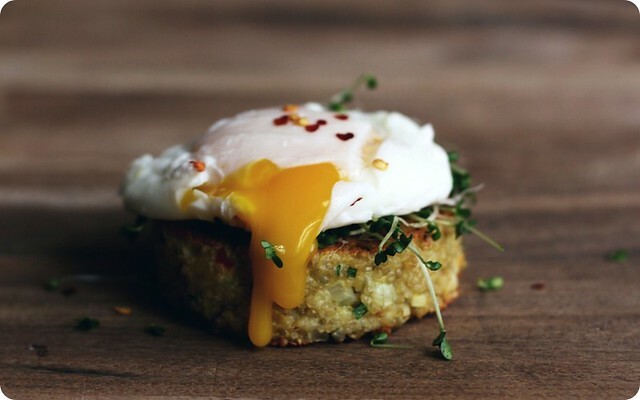 Like the images she captures, the food Heidi creates is beautifully direct. There isn't a lot of extraneous fuss for the sake of fanciness; if she suggests an ingredient or method, you can be well-assured there's good reason behind it. It is this thoughtful approach to cooking that is so appealing about Heidi; it's as obvious in her meals as it is in the words she chooses to describe them. Her tone is gentle and welcoming, convivial while instructive. Super Natural Every Day carries on as the elegant extension of Heidi's site, and follows up her highly-acclaimed book Super Natural Cooking. For those unfamiliar with Heidi's food philosophy, she promotes a vegetarian, whole-foods kitchen, with a detailed emphasis on unrefined sweeteners, whole grains, and conscientious choices of fats. That said, Heidi isn't one to sermonize; she lives her life, cooks her food and tells you about it. It's accessible, easy cooking that is delicious first and foremost, full stop, without asterisk or side note - the fact that it's good for you is an added bonus. The book is an obviously personal one. Heidi shares favourite recipes from her repertoire alongside evocative photographs of her day to day. There's an intimacy to her voice that brings you into her kitchen, and her notes on each dish show an unmistakable familiarity that only comes from a heartfelt enthusiasm. Heidi moves easily between influences - there's dukkah, harissa and gribiche in here, tinto de verano and macaroon tarts. The flavours are varied and celebrated, like the well-worn bits and pieces of a treasured scrapbook, and her recipes are testaments to her affection for them. 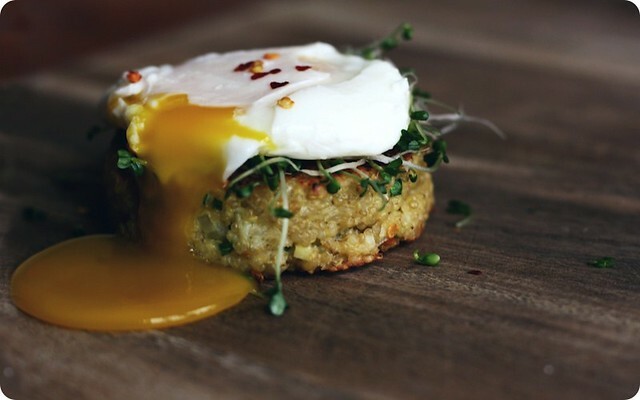 One dish that I think serves as great example to Heidi's style is her Little Quinoa Patties. A seemingly humble collection of ingredients, quinoa, eggs, and breadcrumbs, are punctuated by fresh onion, chives, garlic and a grating of cheese. Pan-fried until crusted and golden the cakes get unexpectedly gutsy; the exterior deeply caramelizes, especially where the onion catches, and turn aromatically nutty. The interior is soft and bouncy, with the curlicues (Heidi's word) of quinoa still sweet and mild. She suggests them hot or cold as a snack. We ate ours with poached eggs and broccoli sprouts on a rain-sodden afternoon. After the plates were scraped clean and the kettle was put up for tea, someone said to me "I would eat that every day." You couldn't hope for higher praise. I'll say it again, Heidi, well done. I've been having to sit on my hands to keep from telling you all about UPPERCASE Issue #9 - it's the food issue! That's right, page upon beautiful page full of stories on all aspects of food and garden. It's going to be good. In the Kitchen column I'll be talking about honey, offering up a recipe for Butter Roasted Walnuts with Thyme Infused Honey and chitchatting about honey varietals. On top of that, I'm terribly excited to tell you that I was also granted the opportunity to talk with Heidi Swanson, Carrie and Andrew Purcell and Aran Goyoaga to discuss food photography and styling. In the interviews we explore their varied approaches and perspectives when it comes to photographing food; their answers are both educational and inspiring. I can't wait for you to see it and I can't thank them enough for taking part. UPPERCASE #9 will be out in the coming weeks. It's available here online, or check the magazine's website for your local stockist. Late breaking, and just added, the folks at Saveur magazine were exceptionally nice in asking a few questions as part of their "Sites We Love" series. I'm in better company than I could dream, and thank them for their kindness. If you'd like to see the interview, it's now live. From the book Super Natural Every Day by Heidi Swanson (Ten Speed Press, 2011). Combine the quinoa, eggs, and salt in a medium bowl. Stir in the chives, onion, cheese, and garlic. Add the bread crumbs, stir, and let sit for a few minutes sot that the crumbs can absorb some of the moisture. At this point, you should have a mixture you can easily form in to twelve 1-inch / 2.5 cm thick patties. I err on the very moist side because it makes for a not-overly-dry patty, but you can add a mroe bread crumbs, a bit at a time, to firm up the mixture, if need be. Conversely, a bit more beaten egg or water can be used to moisten the mixture. Heat the oil in a large, heavy skillet over medium-pow heat, add 6 patties, if they'll fit with some room between each, cover, and cook for 7 to 10 minutes, until the bottoms are deeply browned. Carefully flip the patties with a spatula and cook the second sides for 7 minutes, or until golden. Remove from the skillet and cool on a wire rack while you cook the remaining patties. Alternatively, the quinoa mixture keeps nicely in the refrigerator for a few days; you can cook the patties to order, if you prefer. If it's your thing, I added about a 1/2 teaspoon of crushed red pepper flakes to the uncooked quinoa mixture. I think some fresh chili would work too.